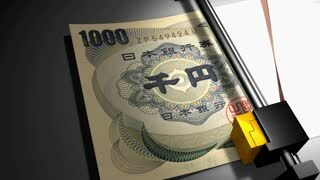 Search Results for "Japanese yen"
Concept animation, Japanese Yen money printer. The concept of falling exchange rates Japanese Yen . Money making idea. Light bulb with Japanese Yen symbol. The concept of the growth of the Japanese yen exchange rate. Money making idea. Light bulb with Japanese Yen symbol. Loopable: Random pans over Euro, American, Dollar, Swiss Franc, Russian Ruble, Chinese Yan and Japanese Yen bills. Forex // currency exchange rate concept. Animation icon or emblem of Japanese yen Logo. . Background made of glow particles as vitrtual hologram. Shiny 3D seamless animation with depth of field, bokeh and copy space. Red color V1. Loopable: Banknotes printing/counting machine animation. Flipping 1000 Japanese Yen bills. Infinite flow of money.